Giving some Minnesota love to the local shop Primp Boutique. Love this graphic tee the designed for their affordable shop! 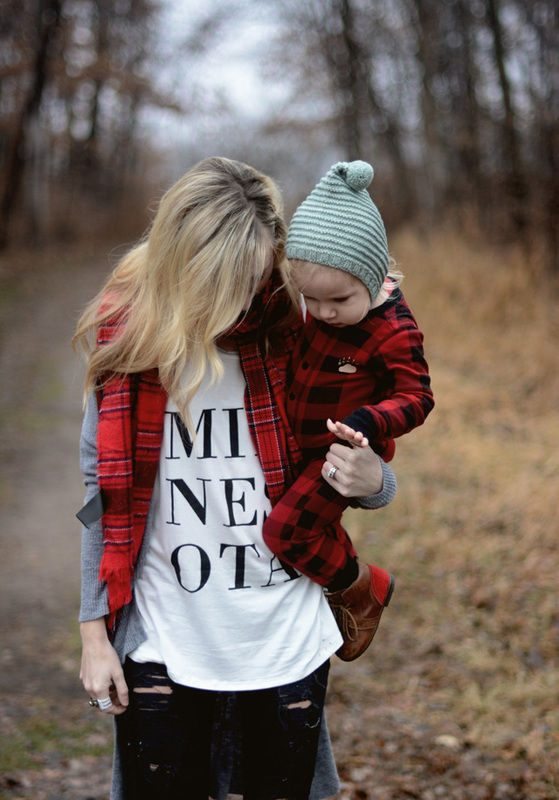 I feel like I am piling red plaids on everything these days because nothing screams Christmas more than red flannels. We are barely needing layers here which is shocking for mid-December and I am praying for one burst of snow before the holidays come, because Christmas should always be frosted white. And just like Santa I always have my little elf on hand to help me make sure that I enjoy the season. I am loving all the twinkly lights and the melodies of Christmas. I also feel like this is the perfect time to start reviving my obsession with Gilmore Girls, which I am awaiting someone to give me the last season on DVD since I have all the others. Hint Hint Andy in case you are reading this! I know the cold is just around the corner so when I burry myself by the fire I know I will need Lorelei's insightful parenting advice to get me through the months.